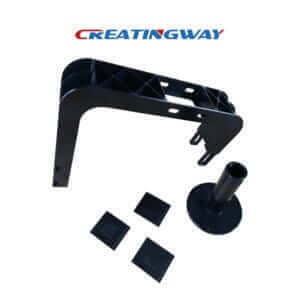 Currently, most of CNC machining parts manufacturer in industry is seeking for more reasonable and Customized services for their projects, from easy 1pc sample, rapid prototype to small lots production like 50pc, from easy single parts machining to product welding and assembly, Creatingway will provide more choice, from drawing draws, project design to cost analysis till to final production manufacturing and shipment, we will be able to make whole process to your projects easy and comfortable. Delivery time is faster, provide flexible working and production time as urgent need. Offering single engineering with good English communication to service your projects. Creatingway own special CNC machining, CNC milling&turning, lathe. EDM, Laster cutting, Fabrication, welding and assembly. Our machining services range from auto parts, medical device, spare parts, oil&gas facilities, PC devices to LED light devices parts etc. Our machining material range from aluminum alloy, bronze, copper, stainless steel, Nylon, PMMA, PC etc, most of materials from open marketing, or specified material from customers. Machining cost is lower than oversea. It is almost one time or several time for some of EU country. and production time is 7 days for normal order quantities. If any urgent, we can have flexible working time to meet you. Offering more reasonable shipping such as express DHL, UPS, Fedex, or by air freight, or by ocean to your port or address. Assigned engineering to work with you from design, machining to production. Reply you in 12 hours. Welcome visit our website and factory, and starting one easy project now, you will feel very pleasure and satisfaction.